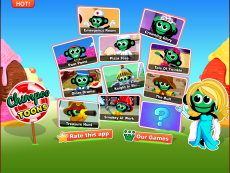 Chimpoo.com – one of the top virtual worlds for kids is now entertaining children of all ages on the mobile! Now kids can watch the famous Chimpoo Toons from Chimpoo Island make their debut on the Apple App Store with its very own Toon Theatre! With the who’s who of Chimpoo Island sashaying down the red carpet, right from Miss Chimpoo, Beatrice the Waitress, Chimp the Kid to Captain Bananas and Chief Smokey! Kids can now watch the funny antics and adventures of all the famous Toons and more on their Apple iPad and take them along wherever they go! Step into the limelight with Chimpoo! Download Chimpoo Toon Theatre on your iPad today – click here to download!